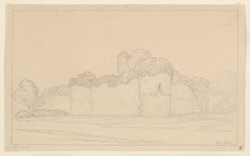 Drawing of the ruins of Skenfrith Castle in Monmouthshire (now in Gwent). The castle is a four sided, irregular shaped enclosure, built around a large round tower. As can be seen in this drawing there were also smaller round towers on the corners of the curtain wall. The castle was built between 1219 and 1232 by a Marcher Lord Hubert de Burgh. He had had military success in France fighting against King Philip Augustus. Consequently he was rewarded by King Henry II of England with the rights to several castles. In building Skenfrith, Hubert was influenced by the castles he had seen while campaigning in France.